Yes! Healthy Waffles are a Reality! All of the Food for Life healthy waffles are made with sprouted grains. This process releases hidden nutrients in the grain, while at the same time enzymes break down sugars in the grains, leading to a product that is low in sugar, low glycemic, and high in fiber and nutrition. Sprouting actually provides you with a complete vegetable-based protein. Another reason why Food for Life healthy waffles are better for you is that they don’t contain any baking powder. Many waffle producers use baking powder in their ingredients. Because baking powder isn’t all natural, it affects the organic nature of the product. Another issue with baking powder is that it interacts with yeast in the bread. This can cause a problem for people who need to avoid yeast in their diet. In comparison, the healthy waffles available from Food for Life are made with all natural ingredients. 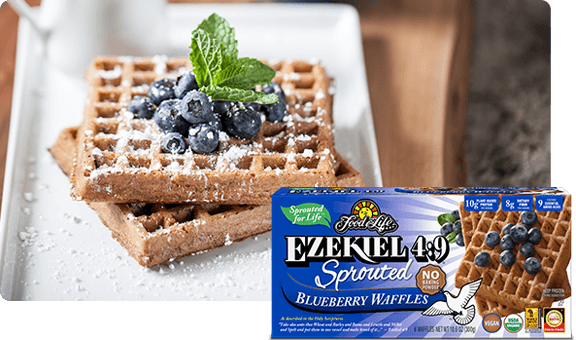 The best ingredients, combined with the hidden nutrition released from the sprouted grains, help make Food for Life waffles the healthiest choice you can buy. Food for Life never uses anything artificial. That means no refined sugars, no shortening, no preservatives, no GMO’s. Find out more about the Food for Life healthy waffles. Locate a Store near you that sells Food for Life waffles. Shop Online for your favorite Food for Life waffles, and be sure to try other great products as well.